Until the Portuguese explorer Vasco da Gama arrived on the shores of southwest India at the close of the 15th century, India’s Christians flourished in a unified church. Referred to as Thomas Christians, they traced their faith to St. Thomas the Apostle, who evangelized the south of India after his arrival in the year 52. India’s Thomas Christians were joined by 72 Christian families from Mesopotamia, who according to tradition, arrived in the southwestern Indian port of Cranganore in 345. Led by Thomas Knaniya — a merchant who belonged to the Church of the East, a community in Mesopotamia also founded by St. Thomas — these families brought with them a bishop, Mar (a Syriac honorific for “Lord”) Joseph of Edessa, four priests and several deacons. While Thomas Knaniya’s Mesopotamian community prohibited intermarriage, thus forming a closed community, their priests strengthened relations between the Church of the East and India’s Thomas Christians. The catholicos-patriarch of the Church of the East — which adhered to the most ancient rites of the church, known as East Syriac — regularly dispatched bishops to India to ordain priests and deacons and regulate ecclesial life for both communities. Common commercial interests also deepened the relationship between the two. In the eighth century, the Church of the East’s catholicos appointed a Mesopotamian cleric as “metropolitan and Gate of All India.” Though exercising considerable authority within the church in India, he typically did not speak the language of the people. Consequently, real power resided with an “archdeacon of All India,” a dynastic office for native Indian clergy. For nearly 1,500 years, India’s Thomas Christians were fully integrated into south Indian society. While their traditions and liturgical practices reflected their East Syriac roots, other elements of the spirituality and culture of the Thomas Christians — such as their method of praying for the dead, avoidance rituals associated with the caste system and eating customs — revealed their Hindu cultural heritage. Portuguese colonization of south India, which also included efforts to bind the Thomas Christians to the Church of Rome, shattered their unity. Today, the spiritual sons and daughters of St. Thomas include more than ten million believers divided among seven jurisdictions — Catholic, Orthodox and Protestant. The Indian Orthodox Church is divided into two groups sharing the same Syriac rites and traditions. The largest, the Malankara Orthodox Syrian Church, includes some 2.5 million members. Another 1.2 million Orthodox Indians belong to the Malankara Syriac Orthodox Church. Most live on the subcontinent. But recently, thousands of families have settled in North America, Oceania and the Persian Gulf. To learn more about the Thomas Christians, and the Indian Orthodox Church, click here. In this image from 2007, a young couple is married in Tbilisi, Georgia. 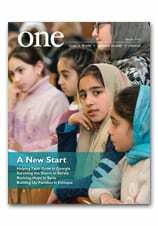 To learn more about the resurgent faith of this ancient nation, read “A Georgian Revival” in the March 2007 edition of ONE. Smoke rises after Russian airstrikes hit ammunition-stores and bases of two opposition groups in the Mansoura region west of Aleppo, Syria, on 6 October, 2015. Thomas Christians light votive candles at an outdoor shrine in Valliapally, Kaduthuruthy. In the deep south of India, an Eastern Christian community has flourished since ancient times. Originally a distinctive people united in faith, customs and caste, they are named for the Apostle Thomas, who according to tradition brought the Christian faith to the Malabar Coast of southwestern India after the ascension of Jesus. Today these Christians, all of whom belong to the Syriac Christian tradition, are fragmented into seven churches. The largest, the Syro-Malabar Catholic Church, each year exports priests and religious to northern India, Europe and North America, as it grows and flourishes. Though Indian Christianity has often been described as rooted in Western colonization, its presence dates almost 2,000 years. According to the “Ramban Song,” an ancient Indian poem, St. Thomas arrived on the shores of the Malabar Coast (present-day Kerala) in A.D. 52. He preached the Gospel, baptized 32 Hindu Brahmin families, founded seven churches and, in the year 72, died a martyr’s death. His tomb, in Mylapore, Madras, remains an important site of veneration today. Christians and Hindus kept alive the memory of the “holy man,” chronicling the apostle’s deeds and the sites associated with his life and work. Scholars have long debated whether or not Thomas the Apostle founded the church of India. But sufficient historical evidence — including archaeological finds validating the existence of first-century Jewish communities on the Malabar Coast — as well as the existence of contemporary accounts passed from generation to generation by Christians and Hindus indicate the likeliness of Thomas’s travels and deeds. For more than 1,500 years, the Thomas Christians were fully integrated into South Indian society. While their traditions and liturgical practices reflected their Eastern Syriac roots, other elements of their spirituality and culture, such as the method of praying for the dead, revealed their Hindu cultural heritage. The arrival of the Portuguese in May 1498 dramatically changed the lives of all on the subcontinent. To support his commercial interests and consolidate his real estate gains, the Portuguese king utilized the missionary zeal of several religious communities of the Latin (Roman) Church, especially the Dominicans, Franciscans and Jesuits. The erection of the Latin Catholic Diocese of Goa in 1533 — which claimed jurisdiction over all of India’s Christians, denying the authentic authority, rights and privileges accorded to the leaders of the Thomas Christians — ushered in an age of turmoil. In 1599, Latin usages were formally adopted by a diocesan synod held in Diamper. The Thomas Christians reluctantly signed the synod’s directives, though most church historians question the legality of the synod. The impositions of Diamper radically changed the nature of the Syriac church of India. Thomas Christians retained a few elements of their tradition, but authority, customs and law rested with the Portuguese hierarchy. Diamper polarized the Thomas Christian community, culminating with the historic Coonan Cross Oath in January 1653. There, representatives of prominent Thomas Christian communities formally severed their ties to Rome. Eventually, those Thomas Christians independent of the Portuguese pledged fidelity to the Syriac Orthodox patriarch of Antioch and today make up the two communities which form the Indian Orthodox Church. Pope Alexander VII sent Carmelite friars to India to restore calm and church unity. And by 1662 most Thomas Christians returned to full communion with the Catholic Church, forming the core of the Syro-Malabar Catholic Church. Read a full account of the Syro-Malabar Catholic Church from ONE magazine here. Students play educational games at Good Shepherd Day Care Center in Addis Ababa. On a recent visit to the Bethlehem center, more than 150 children, all under 7, were fully engaged in their classes. Some recited the English alphabet: “C! C is for cat.” Others practiced Amharic, their national language. Improving the lives of poor young adult women is an important part of CNEWA’s mandate. Read more about “Breaking Barriers” for women in the March 2007 edition of ONE.